Thirsty Pilgrim: Which is Smaller: The Average Output of a French Craft Brewery, or my French Vocabulary? Which is Smaller: The Average Output of a French Craft Brewery, or my French Vocabulary? Question: What's the difference between a French microbrewer and an American one? That was a little joke from Simon Thillou, proprietor of the excellent Cave à Bulles bottle shop in Paris. Any serious search in Paris for French craft beer starts and ends in his shop. And that's all the sneak peek you'll get into an article I'm trying to sell at the moment (want to buy it?). The bottle you see here is not in Paris but Brussels, generously shared with us a few months ago by Jean Hummler at Moeder Lambic. 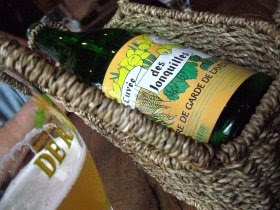 This is the balanced and refreshing Cuvée des Jonquilles from the Bailleux brewery in Gussignies. From Cave à Bulles recently we also picked up a bottle of that brewery's Saison Saint-Medárd, which really blew the Missus and I away as a classic and dry saison-type beer in the Belgian mold. Either are versatile with various foods, moods and weather. Just our style. By the way: Jean says Moeder Lambic will be offering some special treats during next weekend's Bruxellensis festival, which takes place just a few blocks away. That festival, meanwhile, promises some fun beers from Germany, Italy and Spain – besides all the Belgian beauties. Incidentally I've offered to volunteer at the festival in a fit of beer-fueled civic enthusiasm. Not sure what I'm in for yet, other than taxing my anemic French to its very limits. Digging into Brussels' Nooks and Crannies. Vapeur Means Steam, Get It? How to Avoid Beers Made from Cactus and Quinua.